Teams from Spencers Solicitors and Ashgate Hospice took part in a charity football match last Saturday to raise funds for the Chesterfield based hospice. Ashgate Hospice is an independent charity that provides specialist palliative care (care to relieve pain rather than cure) at its Hospice and in the wider community for adults throughout North Derbyshire. The Ashgate Hospice football team was made up of hospice staff, volunteers and their families. 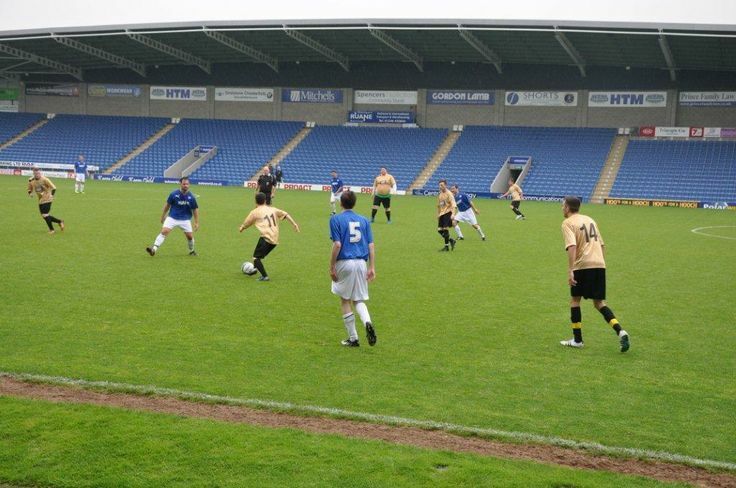 The match kicked off at 10AM on 24th May at the Proact Stadium, the home of Chesterfield FC, and supporters from both Spencers and Ashgate Hospice were in attendance. The Ashgate squad were drawn the home dressing room and donned the blue home kit, while Spencers were outfitted in the flattering gold away kit. After a cagey start by both teams, the match burst into life with a spectacular overhead kick scored by Spencer’s forward Alex Wildman who got on the end of a pinpoint cross from Danny Keenan. Each team then traded goals through the rain with some great saves being made by both sets of keepers and defenders. The match finally ended in a well deserved 4-2 victory to Ashgate Hospice. As well as supporting their teams during the match, Spencers and Ashgate volunteers sold raffle tickets to those in attendance raising over £180 and also collected nominations for a man of the match. Post match a buffet and drinks were provided for the players along with presentation of the winner's trophy to the Ashgate team captain and man of the match award to Spencers Danny Keenan. "The match was a great game and the players from both teams were proud to play a part in raising money for such a vital charity. We would also like to thank all the people who helped organise the event and came out to support their local hospice." Please visit our Pinterest board or facebook page for more match photos, and you can also donate to Ashgate Hospice via justgiving.com. At Spencers Solicitors we are fearlessly committed to our clients and ensuring that their best interests are central to everything we do. To maintain this focus, we request client feedback at the conclusion of every case we handle. By sharing the responses we receive, you'll find out why clients choose Spencers Solicitors to deal with their legal issues. Our offices are conveniently located near to Chesterfield town centre & fully equipped with onsite meeting facilities, disabled access and free parking.